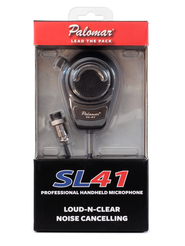 **New Nov 2016: The Palomar SL41 is an excellent noise canceling microphone for Cb radios, 10 meter radios and other uses. The Palomar SL41 combines modern engineering and technology with a time-tested design to provide the professional driver with the ultimate noise cancelling microphone. Palomars customized microphone element provides unmatched noise cancelling capability without sacrificing true-to-life sound quality. This is made by the original Palomar company from the 1960's and 1970's. More new Palomar products are expected. 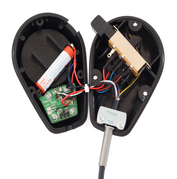 The SL-41 mike is wired for most 4 pin Cb radios and 10 meter radios. Additional wiring is available. **Update: This item is discontinued by the manufacture and not currently available. If they become available in the future this page will be updated. *If your radio does not have a standard 4 pin microphone connector please list the radio model and number of mic pins in text box on the right. There is a $12 wiring charge added automatically if you use the text box.